Happy Birthday! from me and double on Kate’s behalf. 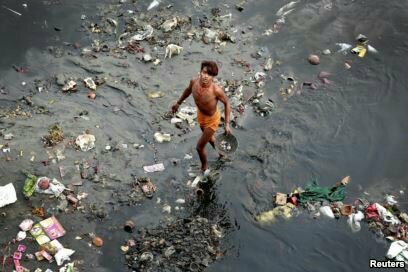 A man sifts through rubbish in the Yamuna river in Delhi, India. cynthia lets out a whoooop! is lo’s news: We finally stopped the Nestlé water bottling factory in the Gorge!!!!!!!!!!!!! After almost a decade of fighting! Kate Brown, the third Oregon governor we have campaigned with hundreds of thousands of letters, many actions, etc, finally listened and stopped the water transfer!!! 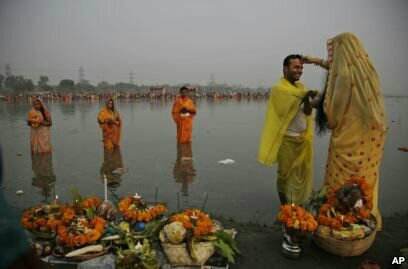 A Hindu devotee applies vermillion powder on the forehead of her husband as they perform rituals on the banks of the Yamuna River during Chhath Puja festival in New Delhi, India.